Author: Kenneth R. Woolling, M.D. 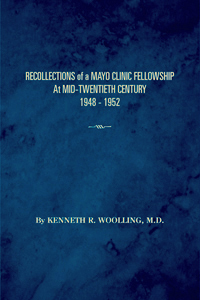 In Recollections of a Mayo Clinic Fellowship at Mid-Twentieth Century, 1948-1952, author Kenneth R. Woolling, M.D. presents the world-famous Mayo Clinic in Rochester, Minnesota, as it existed during his four-year fellowship there. Here is a remarkable, behind-the-scenes view of advanced medical training at this unique institution. This rare book of memories should be of interest to physicians, medical students, history enthusiasts, and general readers alike. You’ll read stories of other outstanding members of the Mayo Clinic teaching staff of that time. Through their exceptional knowledge, skill, and dedication, these physicians provided their students with invaluable lessons for medical practice as well as for life itself. Also featured is an insider’s view of the city of Rochester and its environs. Located in the southeast corner of Minnesota, nestled among pleasant farmlands and peaceful lakes, with snowy winters and balmy springs, remarkable Rochester has its own, distinctive – indeed magical – charm and appeal. Here is an inspiring tale of an extraordinary place, a true medical miracle, rising from the ashes of a devastating tornado to become an internationally-recognized center of health and hope.